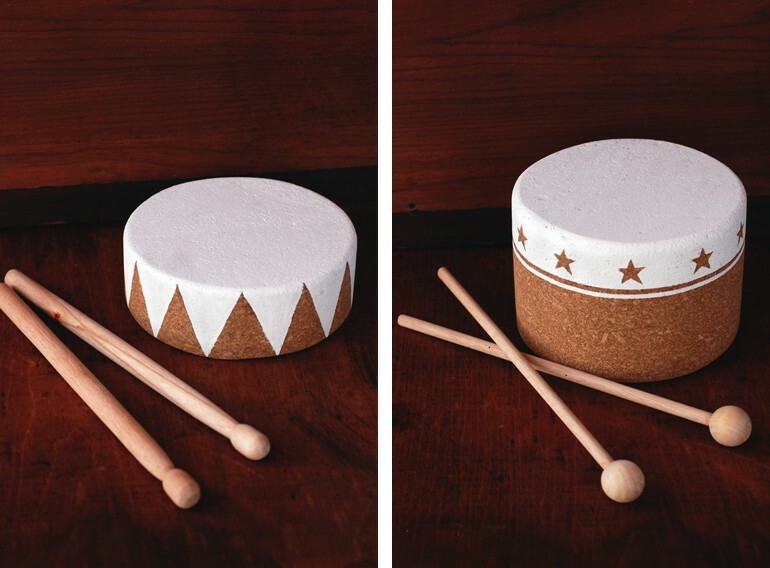 Marla, Manda, and Caitlin are here today from The Merrythought sharing their tutorial for the cutest cork drums. I love the simple and modern style of these toys. If you haven’t checked out The Merrythought yet, we highly recommend it. Their Merry DIY board of tutorials and Merry Parties board have inspiration written all over them. You can keep up to date on their site by liking their Facebook page and adding @Themerrythought to Instagram. 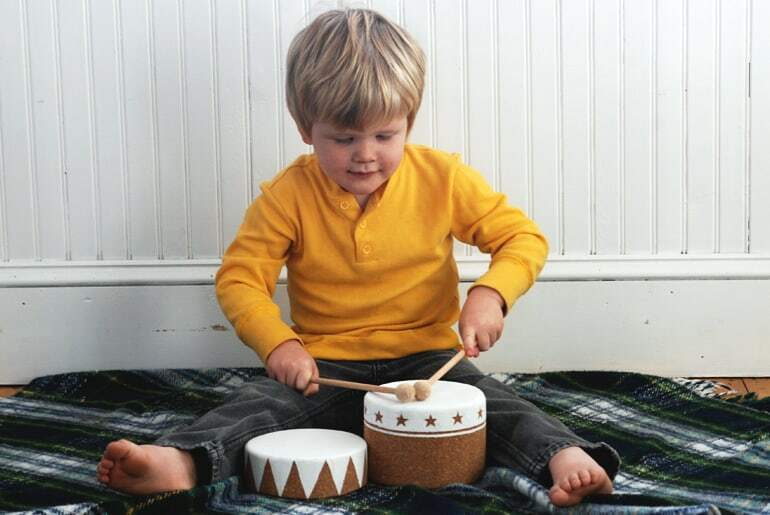 A while back I saw this cute toy cork drum on Pinterest. The store that was selling them no longer has them available, so I thought I’d give making my own a try. It ended up being a very simple and quick DIY – perfect to whip up as a last minute present! 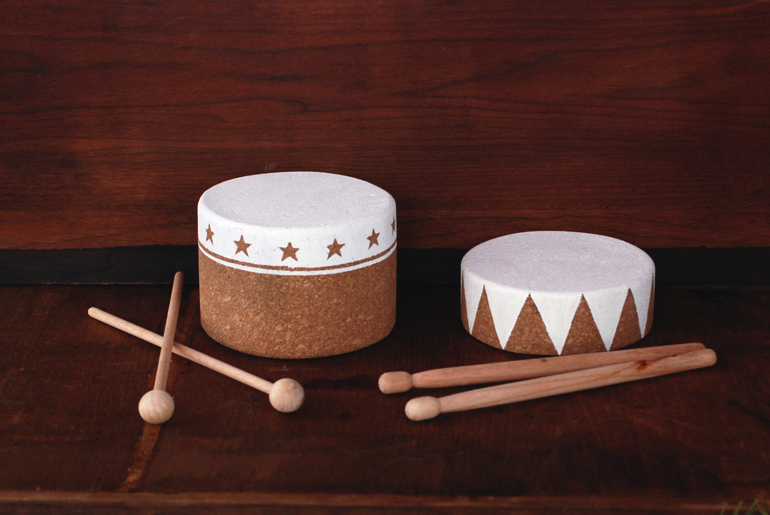 I used cork yoga blocks to make my drums out of (I used 2 – one we cut in half to make it a smaller size drum). (Cork yoga blocks can be found at sporting goods stores, most box stores (like Target), ebay; I got mine off Amazon.) We made two different kinds of drumsticks – one my handy carpenter husband turned on a lathe and the other is a quick diy with supplies easily found at a craft store. 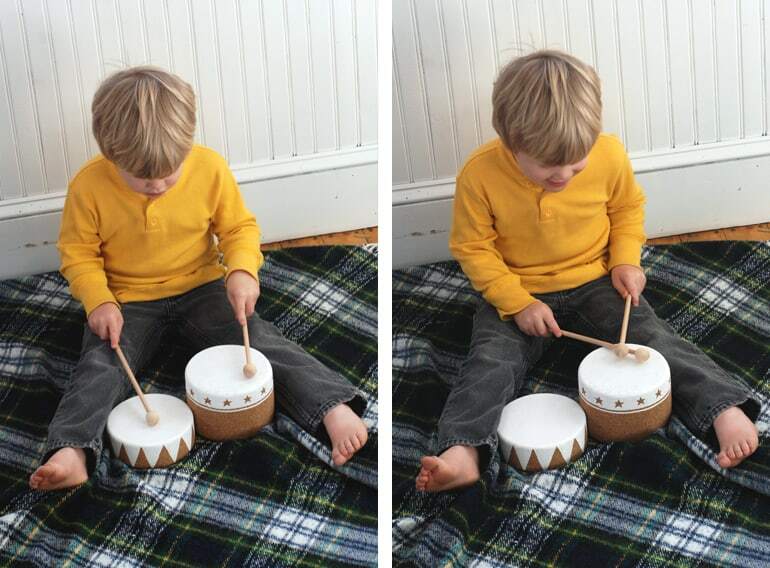 These drums make nice gifts for the little guys and gals in your life – and parents won’t mind them at all – they’re quiet drums! For the cork drum: Trace a circle onto your cork block (we used a bowl to trace). Using a band saw, cut your cork block into a circle. Sand the edges of the cork. Paint as desired. 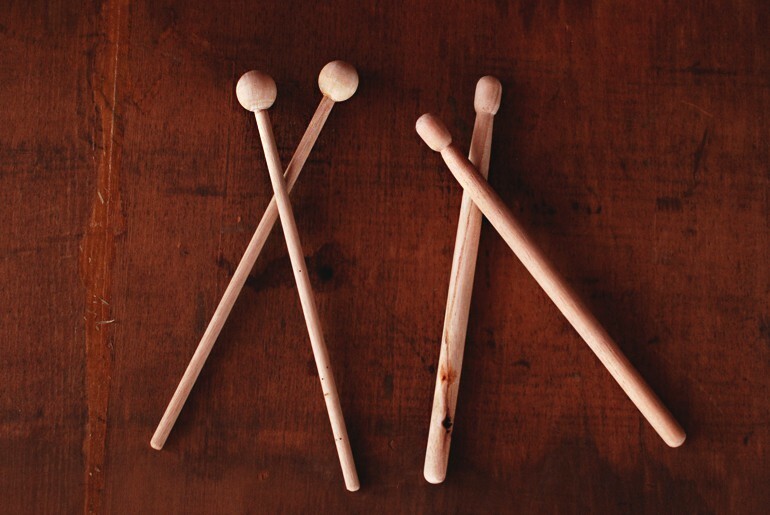 For the drumsticks: If you’ve got a handy carpenter around, you can have them turn a dowel on a lathe and make drumsticks. Otherwise, cut a wooden dowel to size. Put some wood glue inside the hole of the wooden ball, then stick the dowel in. Let dry. (You can also paint the sticks if desired). My little drummer boy seemed to enjoy them! I just stumbled on this website and am so glad I did. What a great idea! I love the drums. 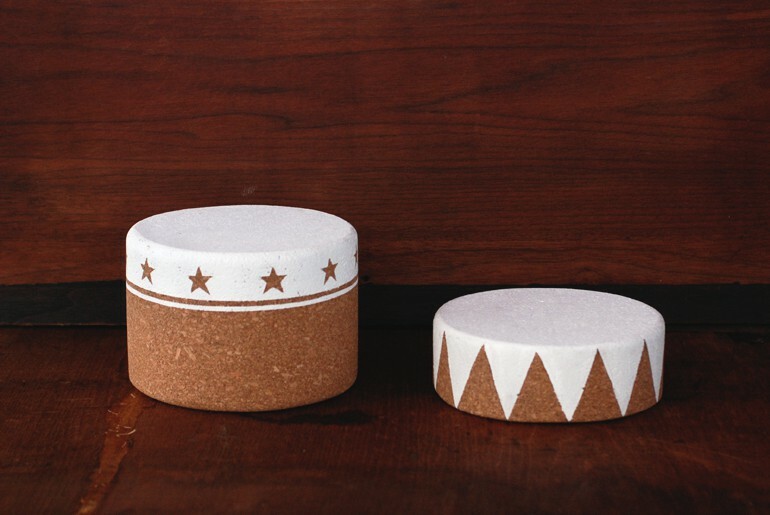 I think I’ll try to make one – I’ve bought cork from http://www.corkstore.com and I know they sell cork yoga blocks too. 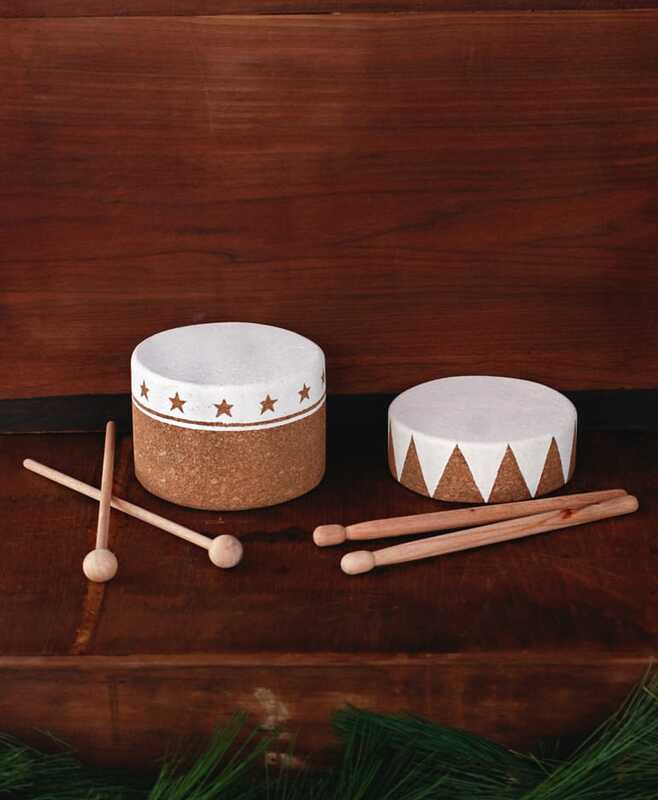 I wonder if cork craft balls on the ends of sticks would work for drum sticks. Very Informative! Good one you explain, Thank you very much for sharing this!